I can't believe it has been 6 days since I have posted. Lots of things happening as usual, I don't know how I ever found time to work. More likely it was that when I worked full time, a lot of stuff just didn't get done. As of today my daughter has been off school from the teacher's strike for three full weeks. The first week was fun, no school, sleeping in--the honeymoon. After week two she was ready to get back. We have a new challenge starting today at Tag You're It. Inspired by the colours, they embossing paste and dimension I came up with this one. Excited to finally ink up my Tim Holtz Crazy Birds stamps. Not my usually CAS style but so much fun to create. Maria Fisher commented on my blog the other day that I was 'goin' mixed media'--ha ha sometimes it just happens. The tag was cut, the embossing paste went on, the bird was stamped over the dry paste and then the cup was added with foam tape. We would l0ove to see you play along this week! I love those crazy birds, but I haven't brought them home yet. Your tag is super! How awesome that there were 5 unis to choose from, wow! And how awesome that both your kids will be in the same town. I'm thinking that is better than you having to drive in two different directions for visits. ;-) It's going to be very different when both your kids are away. I'll be thinking of you when the time comes. Congratulations to Brooklyn. Absolutely wonderful news! So happy for your family and I love the funky feel of your tag too. Now that is one crazy bird! Glad to see you're back in the blogosphere. And congratulations to your daughter. I had the same experience picking the same college as my brother. In the end it was a great decision and were much closer because of it. So exciting that she made her choice!!! I am loving your tag!! That bird is ADORABLE!!!!!!!! Oh this guy is just too cute! Love that you left him as a line drawing... looks as if he hasn't had his first cup!! Lovely news about Brooklyn... I happen to love the idea of big brother being on the same campus - and it sure sounds as if he's happy about it, too! Knowing she will have her big brother close by will make you more comfortable too! 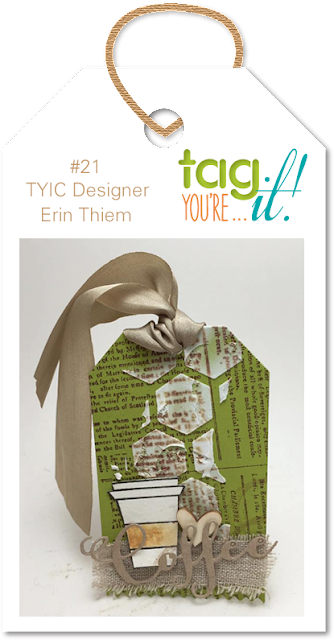 What a fun bird on this tag Tracey, terrific texture too! Your tag is wonderful...I love those birds! Firstly, I have to say that I feel so badly for Brooklyn that the teacher's strike is still going on! So unfair to the kids...just sayin'! I love, love, love these crazy birds, and I think he looks so cool checking out the cup of coffee on your tag! Love the texture you added with the paste, too...it looks really fab with the checked papers! Thanks for inspiring us to play along! What a fun tag! I adore those crazy birds! Your tag is so cute Tracey! I love that comical bird! Congratulations to Brooklyn! You have a lot to be proud of with both of your kids! They sound awesome! yay for 5 universities.. congrats to your daughter..
your tag is too fun. Congratulations to Brooklyn (and you). What a nice feeling that she will be in the same place as Ben. And, convenient for you to visit. 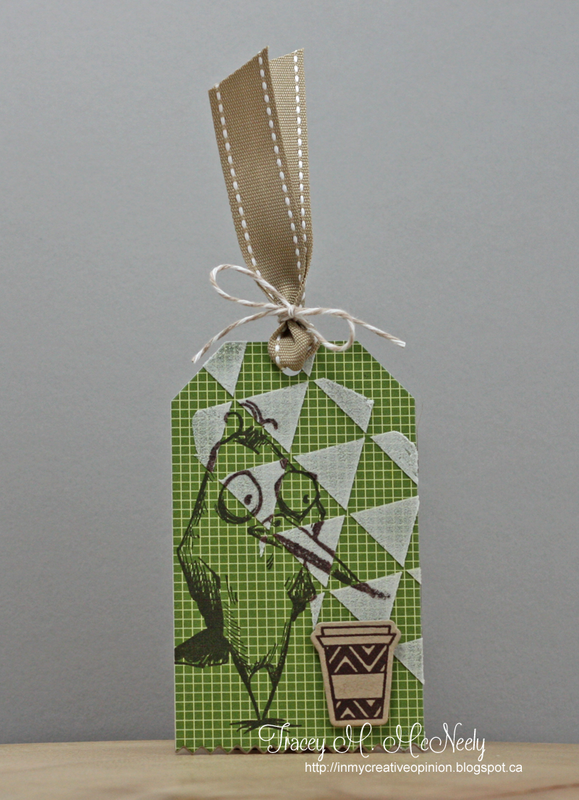 I have been seeing those crazy birds all over the place, and it is nice to see them here on your mixed media tag. I guess you have been living on the wild side with your craft supplies this week. Oh, I have been so tempted to order that bird set! Love the funky image and your cute tag! Congrats to Brooklyn on making her college selection. Sounds like a great choice for everyone and I know you will feel more comfortable with them close to each other. I enjoy both your cards and your tidbits of real life! Don't ever feel you have to stop sharing! Great cards too! A big congrats to Brooklyn...so happy for her. Love your tag and that bird is so darn cute!